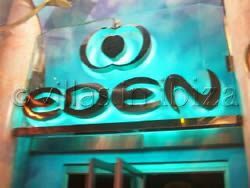 Rebuilt and re-styled in 1999 making it bigger and better than before, Eden is definitely now in the Ibizan superclub league. It has many rooms, a terrace and a sound-proofed isolation room, so you can go wherever the mood takes you. With the finest of world DJ’s such as Dave Pearce, Judge Jules and Tim Westwood hosting their own nights, the quality of the music is second to none. Eden is right in the centre of San Antonio. Find out more and visit EDEN!